Ecole Polytechnique de Paris and Ecole des Télécommunications, Paris; MSc, Stanford University. Vice-President, Organization and Information Systems, Royal Air Maroc; Chief Executive Officer, Mediafinance Bank; Chairman and Chief Executive Officer, Groupe ONA. 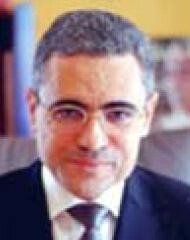 Member of the board: SNI; ONA; Bank-Al-Maghrib, the Moroccan central bank.